Picture a group that has a brand new performance video, Live at the Bearsville Barn, and was selected among the top 30 acoustic artists of the "Next Generation" by Acoustic Guitar in December 1997. Imagine a band newly signed with Rounder Records whose release reached #20 on the Gavin Americana chart and #21 on the Bluegrass Now chart. Consider a quartet that received the only standing ovation for a showcase group at the International Bluegrass Music Association, 1997. Meet the Freight Hoppers, called by veteran Josh Dunson "the most exciting group I've heard in any form of music in at least the past ten years." They possess that rarest of all musical gifts: the ability to connect directly and personally with any audience. The insistent dance rhythm and inherent energy of string band music, combined with their engaging vocals and peerless ability to entertain, make The Freight Hoppers stage seizers in any venue. 1997 delivered a big break out for the band with performances at major festivals including Strawberry, MerleFest, RockyGrass, Winfield, Wheatlands, and Winterhawk, leading dance events like Mentone and Bugstomp, and at hip clubs such as Manhattan's the Knitting Factory and Chapel Hill's Cat's Cradle. 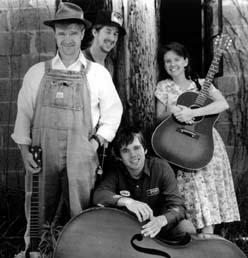 In 1996 the Freight Hoppers performed live on Garrison Keillor's A Prairie Home Companion on National Public Radio, and won second place in the "Talent from Towns Under 2000" contest. Based in Bryson City, North Carolina, The Freight Hoppers bring to life the musical culture of the Appalachian mountains. They play a high-energy style of old-time music consisting of fiddle, banjo, guitar, and stand-up bass. They play and sing traditional music that predates bluegrass, and that was originally played during old-time square dances and social and family gatherings. Many of their songs come from recordings made in the '20s and '30s by bands like the Skillet Lickers, Grand Ole Opry star Uncle Dave Mason from Tennessee, or singers such as the Carter Family from southern Virginia. Other material comes from old mountain fiddlers still playing tunes passed down through generations. Live, The Freight Hoppers deliver a nonstop program of fast-paced fiddle tunes, traditional songs, mountain clogging, and Appalachian folklore. The band and its members have won awards at the Galax Fiddler's Convention in Virginia, the Old-Time Fiddler's Convention in Mount Airy, NC, the Maury River Festival in Rockbridge, VA, and the Appalachian String Band Festival in Clifftop, WV, where the group won First Place Traditional Band in 1996. Few ensembles of any kind match the energy and talent of The Freight Hoppers. Says Out & About, "The way they play it, this music doesn't sound dated at all. They make it as fresh and invigorating as if they created it themselves, and that is no easy trick to accomplish."